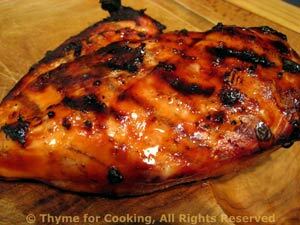 Grilled, Marinated Chicken Breasts, Thyme for Cooking easy summer recipes. I have a number of different marinades for chicken. I decided it was easier to number them than come up with unique names. They only need to marinate as long as it takes to get the grill ready... but longer is fine! We prefer slicing chicken, rather than serving the whole breast - nicer presentation. In a small bowl whisk together soy sauce, ketchup, vinegar, oil, garlic and oregano. Put chicken breasts in a glass baking dish and pour marinade over. Let marinate for 15 - 20 minutes or up to 2 hours. Cook on barbecue grill for 8 - 12 minutes per side or until done (test - take a peak), basting once with any leftover marinade. Remove chicken, slice at an angle in 1/4" (.6cm) slices and serve.